In this interview, Good Day New Mexico discusses 401(k)s and why you do not have to risk your money to get a decent return grow money with Pamela Yellen, Financial Security Expert and New York Times Best Selling author. Pamela shares how you can build for your future, and take back control of your finances. For the last 20+ years, as a consultant to financial advisors, Pamela has researched over 450 financial products and strategies. Research led her to conclude that Americans have been brainwashed into believing we must risk our money to grow it. 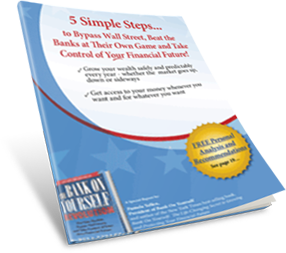 Her book, The Bank On Yourself Revolution, Fire Your Banker, Bypass Wall Street and Take Control of Your Own Financial Future, is based on a strategy and product that has been around for well over 100 years. There are many myths, misconceptions and misinformation about it. She addresses questions we all ask, such as, “Will I be able to retire?” and, “What will I have to give up to retire?” She also discusses a financial asset that increased in value at a time when the S&P 500 plunged by 40%, increasing by a guaranteed, preset and exponential amount, and suggests questions to ask 401(k) plan managers. Get Pamela’s Free Wealth Building Report here.